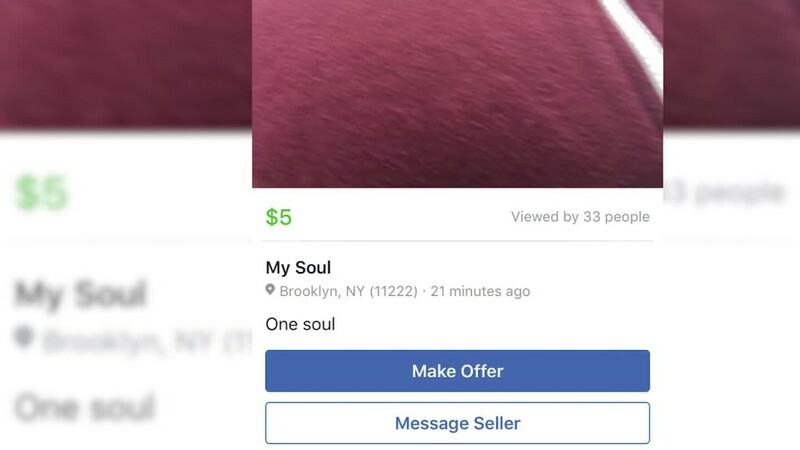 Within hours of Facebook launching Marketplace, the Craigslist-esque forum had already been overrun by users selling a mix of bizarre and illegal items. In Pittsburgh, a can of beer was listed for $25. In London, someone was trying to "sell" his pregnant girlfriend for $400. And in New York, someone listed "About 6 Oz. Water (Bottle Not Included)" for $56. On Tuesday, Facebook (FB) blamed a "technical issue" for all the strange posts, but didn't elaborate on what the issue was other than to say it prevented the review system from screening posts that violated its Commerce Policies. Facebook's guidelines prohibit a dozen categories of products from being sold on its platform, including drugs, animals, "adult items or services," alcohol and weapons. Although Marketplace is a new feature, people have always been able to buy and sell things on Facebook. Stopping things like private gun sales has been a problem before. "We are working to fix the problem and will be closely monitoring our systems to ensure we are properly identifying and removing violations before giving more people access to Marketplace," Mary Ku, Facebook's Director of Product Management, said in a statement. Facebook has stopped the rollout of Marketplace while it works on a fix. The company said it's still working to remove all the strange items that appeared because of the issue. It said it also expects to find listings that violate its policies to "periodically" slip through, which will be dealt with on a case by case basis. More than a billion people log into Facebook every day, making it difficult for the company to police everything that's posted. In addition to automated reviews, Facebook says it gives people tools to report items they feel shouldn't be listed. Facebook is also working to improve its image recognition technology, which could help the site identify illegal products before they're uploaded to the platform.